A roofing system does not last forever. Eventually, one or more of its components break down and need to be repaired for minor damage or totally replaced for major one. The degree of deterioration and time it takes before they need maintenance work depend to a large extent on the materials used for the part. Take for example, the roof gutters Seattle. Gutters play an important function in the roofing system by collecting rainwater from the roof and directing it downward to the ground through a downspout or the more artistic rain chain. Because of its constant exposure to the elements, gutters eventually degrade. Impeding to a certain degree, the deterioration of gutter is within the means of homeowners by choosing the right material used for making the gutter. Metal and plastic are two of the most common gutter materials today. People who prefer metal gutters do so for its durability and strength. Unfortunately, metals are prone to corrosion or rust. 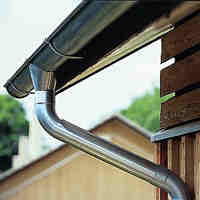 That is the reason why some homeowners choose stainless steel gutters for their homes. Stainless steel is a term used to refer to the stainless quality of gutters. Stainless steel has anti-corrosive element, making them ideal for use in a variety of corrosive environments. This quality allows the gutter to remain stainless for years if not decades. Without the destructive corrosion to affect it, stainless steel gutters need not be replaced and will last a long time. They are practically indestructible. Stainless steel gutters are strong, durable and can take punishment from even the harshest elements. These two qualities – strength and durability – make stainless steel gutters an attractive option to most homeowners. Since stainless steel can handle both hot and cold temperatures, it is the ideal gutter material for houses located in harsh climates and storm-prone areas. They are shiny and look pleasing to the eyes. The shine coming from the stainless steel makes your gutter look always new despite having been installed for some time. Because of this quality, stainless steel gutters can add luster to and improve the aesthetic appeal of your homes. They do not rust. This factor is perhaps the single most attractive quality of stainless steel gutters that cause people to select them for their homes. A distinguishing characteristic of stainless steel from other metals is its anti-corrosive property. One of the strongest reasons people choose stainless steel gutters over other metal gutters is its ability to resist rust or corrosion.